"It was nice and clean resort." Have a question for Vinpearl Luxury Da Nang? "The staffs are so nice and helpful." "Very relaxed atmosphere, scenic and picturesque surroundings with a huge beachfront and multiple infinity pools." "Relax ! 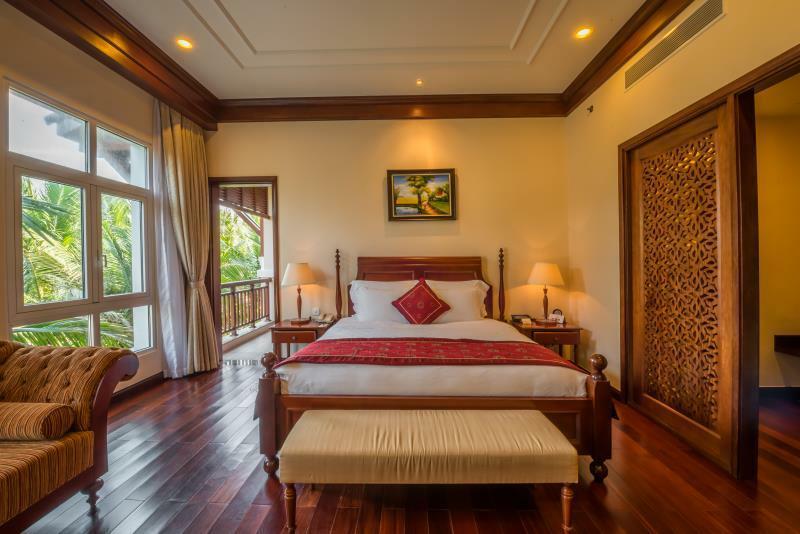 Goood for family and friends"
Vinpearl Luxury Da Nang offers an ideal base from which to embrace cultural exploration of the central coast of Vietnam while luxuriating on one of the world’s best beaches. From here you can explore the ancient town of Hoi An, a UNESCO World Heritage site, that boasts lovely boutique shops, charming cafes, and quaint winding streets, providing amazing insight into the colorful Vietnamese life. Other areas of interest may include Marble Mountain, the ancient citadel in Hue, or the Cham ruins at My Son. If relaxation is more of a draw, guests can rest by one of the five massive infinity pools, chill out in the gardens, or take a stroll along the resort’s 500 meter beachfront. All 200 guest rooms have sea-facing balconies and are equipped with amenities to make your stay as comfortable as possible, including free Wi-Fi, a large screen LCD television with hundreds of movies and games, a separate rain shower and bathtub, complimentary bath salts, and a pillow menu to maximize your comfort and relaxation. Other top notch facilities include two restaurants, two bars, a lounge, café, business center, shopping area, health clinic, kid’s club, fitness center, and a world-class spa. For an exciting and relaxing holiday filled with luxury and exploration, Vinpearl Luxury Da Nang is the perfect choice. Additional terms and conditions apply for the gala dinner on the night of December 24, 2015 and December 31, 2015. 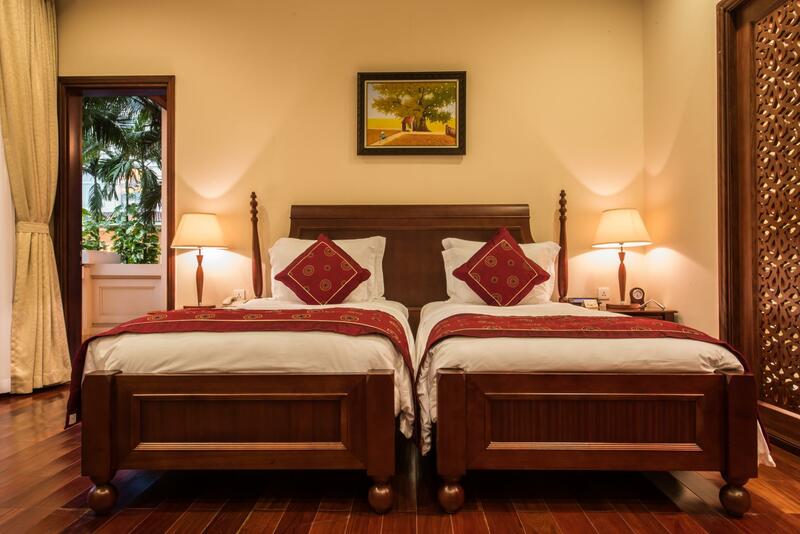 - Maximum occupancy per room is 3 adults and 1 child or 2 adults and 2 children. The room rate is for 2 adults only. Any additional adults or children 4 – 11 years old will be charged. One child under 4 years old stay for free if using existing bedding. - The maximum number of extra beds permitted in a room is 1. - Maximum occupancy of 2-Bedroom Villa is 4 adults and 4 children. - Maximum occupancy of 3-Bedroom Villa is 6 adults and 6 children. - Maximum occupancy of 4-Bedroom Villa is 8 adults and 8 children. - The room rate is for adults only. Additional children 4 – 11 years old will be charged. One child under 4 years old stay for free if using existing bedding. - No extra beds are allowed in the villa. - Children 1 - 1.40 meters will be considered as 4 - 11 years old. - Children above 1.40 meters will be considered as an adult. Guests who booking the full board package, dinner will be served on the arrival date, breakfast and lunch will be served on the following day. Guests who prefer to have lunch on the arrival date are required to contact the property at least 5 days prior to arrival. I asked about the rate checkout at check-in, and the staff said they would check and give me an answer. I was willing to pay an extra charge, but the staff did not give me any answer until the end. The staff was kind but not responsible. Everything was great. I've been in danang for 10days and this resort is still the best. The view was great and the service was awsome. It was the best wedding anniversary. I'll come again with my parents . However the wifi was the slowest in danang resort i've stayed. Thank you for your feedback, we hope to see you again soon. Spacious and clean room. Impressed by kind and smiling staff. Pool also well managed. If you plan to trip with family, it must be good choice. Breakfast is not good as room, but it is okay. many nice pools, one main infinity pool, friendly staff. The breakfast buffet were very good. I have booked beachfront room, they told me they have changed their room type name called "Deluxe ocean view room". the Room view may similar when I was booking the room. But I found that I cannot confirm there are no different. Great resort. Missing better pool service. Shoul have a coffee / cake shop for a afternoon chill out. Why the charge for using a kayak? Tried to book vincom shuttle service and they told they are full on the way back,but the the driver told us actually he's just not coming back . From arrival to leaving could not fault this hotel, stayed everywhere and would rate this number one. The standard, facilities and service are second to none, and fantastic Christmas menu entertainment even if the weather is cool. The service here is very good with nice staff and thoughtful service. In-room facility is well-equipped and the toiletries are very good for hair and skin care. Food at the buffet is fine but you can have better and cheaper option at the city. There are plenty leisure and sport activities for guest seeking for either relaxation or entertainment. Overall staying experience is very satisfying! We love this hotel and will go back again. The hotel is new and located near to Marble mountain.The room is big,bathroom is huge all are well decorated (except the painting is quite strange to our taste). 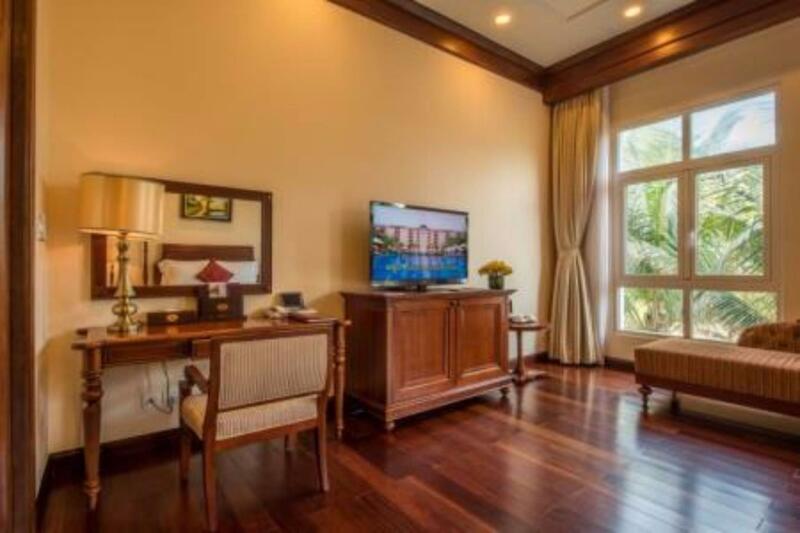 The hotel use high-end products,such as Sony Internet TV with over 1,000 movie to watch,Free wi-fi in the room. The complimentary 3 meals/day are plenty and well presented. We really enjoy our stay there. 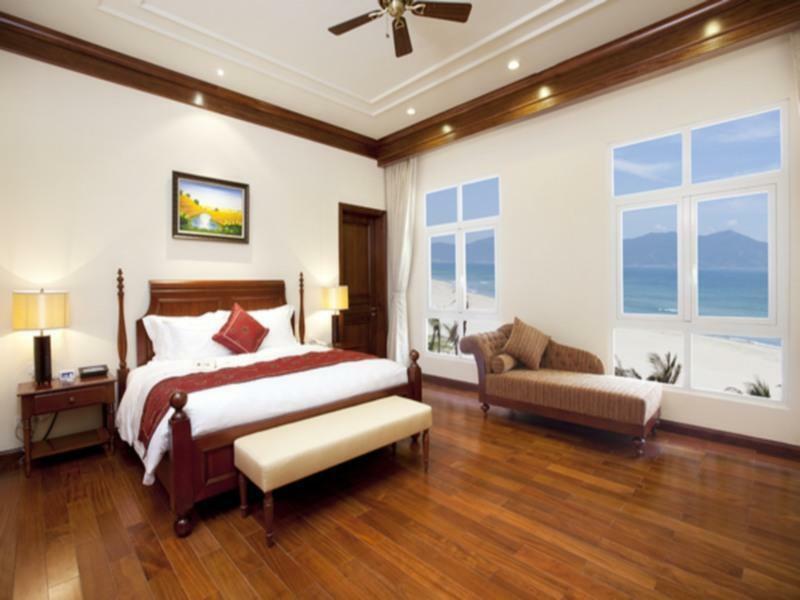 For the values you'll get, this is a TRUE 5-star hotel in Danang! Beautiful bed room with hi-tech remote control for window drapes and lights central station. The bed is very comfortable with nice pillows and sheets. Very big screen TV with good programs for local and foreigner. 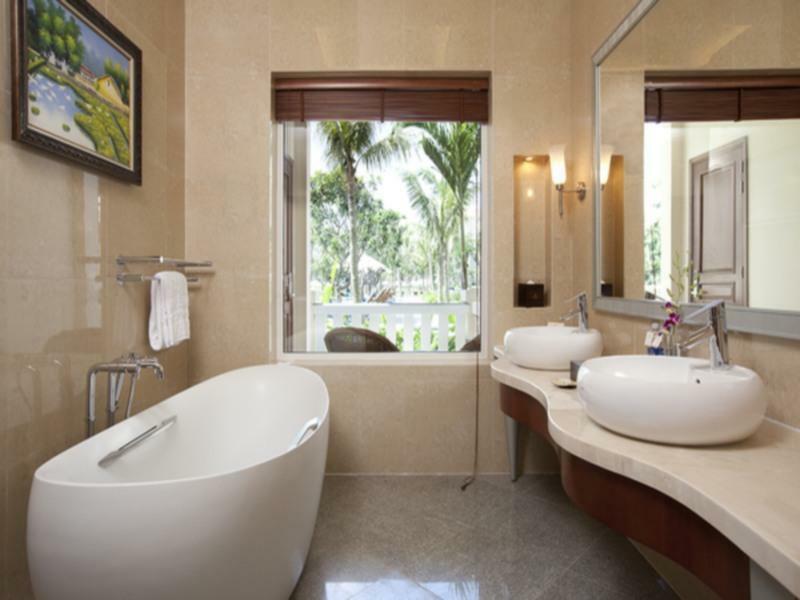 The bath room is very large with very nice bath tub, came with sea salt for you to use daily without additional charge. We have our own balcony with table and chairs looking at beautiful pool. People at the hotel always greeted us with a smile! The hotel's staffs are well trained from top-down. They were always there when you needed help, from getting a pool towel, to wait in line for your “pho” noodle at the restaurant. The Hotel offered 3 free meals daily, excellent choices of mixed local and western foods, we felt like we were on an expensive cruise’s trip! The hotel has many different activities and programs at the pool and in the gym. The pool is so beautiful; we hang out at the pool every day! There is nothing negative about the hotel…We will definitely come back to this hotel again! located in one of the best beach in da nang. blue ocean, white sand, cool wind makes it the real feeling of 5 star resort. there are 2 great things about this resort. 1 is hospitality. friendly staff. great service mindset. especially staff in restaurants. 2 is luxury equipments. room is full with everything needed. restaurant is more than beautiful. only not so good thing is food. seafood pizza from room service is bad. food served in restaurants is ok, but not good enough comparing to its price and the level of this resort. above all, great hospitality made our trip special, so thank you vinpearl luxury danang! i would rather stay at Pullman. The service at Vinpearl was not that great. Fairly new hotel facilities. The breakfast menu was somewhat limited but good enough. The rooms were clean and the staff friendly. It was raining everyday during our one week stay at Vinpearl and there were very few things we could do without the sun and the pool. Such Nice place with very nice and kind staffs from manager to bell boy staffs. Very recommnadable for everyone. Family, Couples, Friends, Indivudual Rests... After all, thank you so much for My mother's birthday events!! It ticked our boxes of relaxing, deluxe,great pools, established gardens, quiet yet convenient. Will stay again 100%. The room was massive, great view, everything you need and so much more. Staff are so happy. Friendly, helpful and a little sad to leave. Sunny in the writers bar is ever so friendly and will do anything to make your visit perfect. The restaurant staff and managers bent over backwards when my partner was laid up with a stomach bug for the day and didnt make it to breakfast. I went to the clinic and they delivered some food for his breakfast. They continued to check in every day after! Reception- phone is answered first ring and so accommodating. Other guests, yes mostly South Korean but friendly quiet and we had plenty of time where we had a pool or corner of a restaurant to ourselves. The food was delicious. Props to the pastry chef, your skills are amazing! Location will be perfect when strip is built up somemore. I'm sadly out of room. Beautiful resort with nice white sand, clean beach. The room is clean and spacious. Bath tub needs to be cleaner but the rest of the bathroom is well kept. Breakfast overall is good however; the noodle soup (chicken/beef) should be change with different selections daily. By the 3rd day, the same type food served looks less appealing to me. We had buffet dinner one night, that Was a big disappointment, the food choices were poor and they tasted unpleasant.. The pools are nice but too many children with blown up animal floaters which caused trouble for adults to swim not without bumping in to those floaters.. The hotel should have a designated pool specifically for children to play with floaters Overall, we enjoyed the facility and satisfied enough. Stayed at the Vin Pearl for the Ironman 70.3 weekend. Very relaxed atmosphere, scenic and picturesque surroundings with a huge beachfront and multiple infinity pools. Staff was attentive except their English left much to be desired. Food was value for money but better choices outside for local fare. 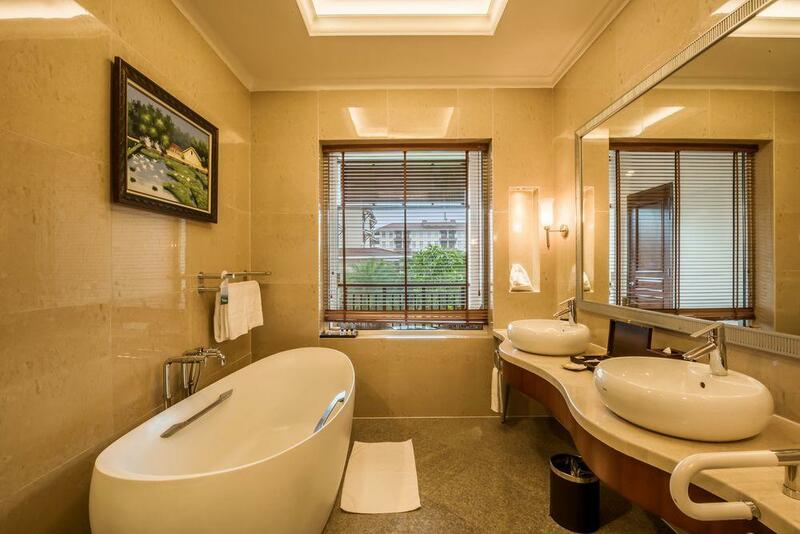 Big rooms with ante rooms, balconies and a huge bathroom is always a plus. Wifi slowed down when more guests arrived but not a deal breaker as we were out quite a bit. Staff is extremely friendly and food at gourmet was excellent. Although I must admit the spread of food is skewed towards the Asian food which I'm fine. The western food quality and pastry is a little on the average. Nonetheless, enjoyed myself!